Often enough, pseudoscience trundles along unchallenged. But sometimes someone who actually knows what they’re talking about picks up a scent and follows the trail of nonsense. Enter Stuart Robbins. He’s an astronomer who hosts the Exposing PseudoAstronomy podcast and authors a blog of the same name when he isn’t staring at stars and stuff. Terry is not happy with Stuart. Stuart has written several blog posts about Terry’s seemingly poor grasp of astronomy. Stuart apparently did not take kindly to Terry’s Frankensteinian meddling with the science of which he spent so much time gaining actual knowledge and decided to voice his concerns. He’s written several blog posts outlining many of her errors, both scientific and grammatical. Such as the fact that ‘retrograde’ is not a noun. Well Terry has had enough! She recently wrote a blog post expressing her dissatisfaction with the attention. Right from the start, the title of “Another Angry White Guy Ready to Pop? You decide” is a bit odd. I have no idea why she refers to him by race. Or declares him angry. Or implies that she has piles of angry white dudes just raging about her. You’ll also notice that she does not actually quote anything or provide links to the offending posts. Curious. She writes: “I want to make everyone aware of a situation that has been ongoing. I am being unjustifiably targeted by Mr. Stuart Robbins of Boulder, CO, in his word press blog. He just looks like one more fixated angry white man ready to pop. He calls me names, he suggests I have had contact with him and personally attacks my character and professional reputation. This has been going on for about 2 years. I thought initially it was just a feeble attempt to promote his website business.” Note: This is direct copypasta from her blog post. I can understand why he tries to help her with her grammar. Let me say that I’ve listened to all Stuart’s podcast and have occasionally read his blog. I simply am not reading a good description of Stuart. As for the behind-the-scenes activities, I can’t vouch for that. Who knows? Maybe Stuart has been a naughty boy! It wouldn’t be hard for her to prove any untoward behaviour considering the digital paper trail that exists in emails and online communication. That is IF he had done anything actionable against her. The fact that her comments are vague and no lawyers have come knocking indicates that he probably hasn’t. This is simply a smearing tactic on Terry’s part. She then makes an odd complaint. “His unwanted attentions towards me are uncomfortable and I seem to be the only astrologer he is targeting and there are many more astrologers for him to include.” She’s upset that he’s singling her out simply because he focuses on her erroneous blog posts. Perhaps she doesn’t realize that maybe she just makes perfect mistakes for which Stuart to use as practical examples in his blog. “He says in his blog that I have threatened him, I don’t know him, and I have ignore his blogs.” Tell me again what he’s written in a blog you’ve never actually read? Gotcha! She then goes on to play psychologist: “I think he’s losing touch with reality and perhaps delusional. In today’s world we don’t need any more hate or angry white men. His rants about me seem to have escalated recently.” Why bother addressing your critics when you can just accuse them of being insane?! Perhaps Stuart should take it to heart. Maybe he needs to reflect on whether his is too angry. Or white. At the very end of the blog post she says something that is truly concerning and it’s the main reason why I wrote this post. Folks, this is something we are seeing more and more often. Skeptics are spending their spare time shining light on the scams and pseudoscience that are all around us. The people promoting those are making big bucks and they see any critical exposure as a threat to their livelihood. They want to hit back but they know they don’t have the evidence to do so. How to get the critics to shut up and go away? Well, why not try to scare them off? Last year the Burzynski Clinic, a seemingly shady ‘cancer clinic’ in Texas tried to silence critics by threatening legal action against criticisms. They even went so far as to respond to Rhys Morgan, a young man in high school in England, by sending Google Maps images of the critic’s own home in a very Mafia-esque move. This was, of course, after their allegedly fake lawyer demanded that he remove any reference to the clinic. This is known as libel chill. The average person can not afford to defend themselves in court so they simply back off. Another tactic, the one that Terry Nazon has chosen, is to go to the critic’s employers and inform them of the actions of the critic. She has superficially framed it as simply informing them that their computers may have been used for potentially illegal purposes, but the real intent is to have the employer lean on the critic and force them to stop. The assumption is that the employer would not want to be sucked into the issue in any way. Stanley Burzynski found out first hand what the Streisand Effect is: “The Streisand effect is the phenomenon whereby an attempt to hide or remove a piece of information has the unintended consequence of publicizing the information more widely. It is named after American entertainerBarbra Streisand, whose attempt in 2003 to suppress photographs of her residence inadvertently generated further publicity.” He got far more negative publicity than he would have if he hadn’t been so heavy handed with critics. Terry Nazon runs the risk of the same with these antics. 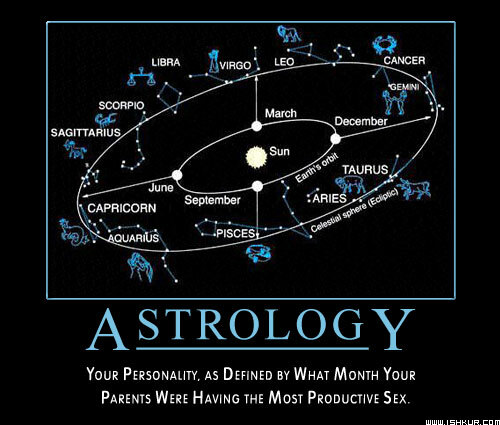 You’ll notice that I didn’t actually say anything about astrology. It’s true that I think it’s nonsense, but that wasn’t the point here. The point of this article is to point out an increasingly common trend among proponents of pseudoscience. Instead of responding to critics by addressing their concerns, so many are opting for bully tactics to shut their critics up. They threaten legal action and interfere with the critics’ personal lives in an effort to make them back off. This is not the reaction of people who can back up their assertions. This is the reaction of people who are backed into intellectual corners and respond with tantrums. Of course, Terry is free to defend Stuart’s criticisms with actual science. I’m sure he’s all ears. And so am I.